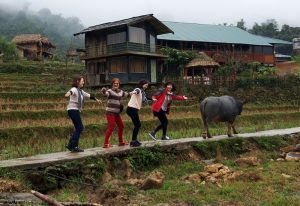 Hanoi – Sapa- Halong 7 days 6 nights tour will be definitely a convenient trip to everybody who want to discover the beauty of northern Vietnam. Following this trip, you will have a chance to enjoy 3 of the most interesting places in Vietnam. Buzzing capital of Vietnam- Hanoi, verdant terraced rice fields of Sapa and the scenic Halong Bay. During that trip you have an inimitable chance to explore both: Beauty of vietnamese nature and a urban charm of asian city. The rest of the day is at your leisure to explore the tree-lined boulevards, French Indochinese architecture and tranquil lakes of this unique city. Have breakfast at hotel and ready for the trip at the lobby OR the meeting points. Our guide will pick you up between 07h45 and 08h00. 08h30: Arrive Tran Quoc Pagoda – the oldest pagoda in Ha Noi built in the 6 th century. cuisine with 8 delicious dishes. Tran Hung Dao who defeated the invader in 13 th certury. 16h15: Tour finishes. Back to hotel and you will have free time for your dinner. 20.30, Our tour assistant pick up from your hotel to go to Tran Quy Cap train station. He will lead you to your cabin on the train. The train departs for Sapa and sleep the night on train. Travel time approx 9 hrs. 06h00: Pick up at Lao Cai train station to Sa Pa by minibus. Arrive in Sa Pa in the mid-morning, then have breakfast and relax at hotel, after that the guide takes you to visit Cat Cat is a small but bustling village situated at the foot of Fansipan Mountain. Here you will see traditional Hmong homes at their best, and you will be able to meet a Hmong family to learn more about their way of life. The village is also the perfect place to see traditional clothing being made, hemp being dyed and women weaving. From Cat Cat we will follow the Muong Hoa Valley for 3km through rice terraces and small dwellings to Sin Chai. This village is a little off the usual trekking route and less visited, but offers the opportunity to see traditional wooden homes built using the indigenous Pumu tree. Transport will be waiting in Sin Chai to take you back to Sapa. After breakfast, the guide takes you to the villages of the H’mong and Dzay called Lao Chai village and Ta Van village.The day is devoted to a beautiful hike through the breathtaking scenery of Sapa valley. Start by road that descends in the wake of the street Cau May (6 km) En route, admire the rice terraces hidden behind mist of the morning, a truly awe-inspiring sight. Follow a small track and cross Muong Hoa River and pass well tended rice terraces on your way to the Black Hmong village of Lao Chai. Continuing through the colorful rice terraces you will reach the village of Ta Van Giay . As you continue your trek along the Muong Hoa River you will cross a small suspension bridge, roughly 2km from the settlement. Here you can discover a fascinating collection of rock carvings. These engravings depict some beautiful images of man, stilt houses and some beautiful decorative patterns. We lunch in a home in the village. After lunch the walk continues through a bamboo forest to visit Red Dao ethnic minority village. After taking a rest nearby a waterfall to refresh, you start climbing uphill to a road where the car is ready for your journey back to Sapa. Take a shower and have dinner in Sapa/Laocai before transferred to Laocai. Overnight on train. 05.30 – 06.00 AM: Arrival in Hanoi train station, our support staff pick you up and take you to our hotel in Hanoi Old Quater, you will have breakfast before enjoying Halong Bay. After breakfast, we will explore Sung Sot cave – one of the finest and widest grottoes of Halong Bay. Next keep cruising and passing the fishing village with its unique way of life. About 04.30 PM, you will arrrive at your hotel in the Old Quarter. Enjoy the last night in Hanoi. Today is your free time at your leisure to enjoy last moment in the North of Vietnam. About 03 hours before your flight, we transfer you to the airport for your flight. With the sincere thanks for your travel to Vietnam and with us, hope that you have enjoyed your Vietnam trip and look forward to see you again! Since this can be private or group tour, the price per person varies and depends on many aspects, such as your group size, the hotel ratings and your departure date. If you want to get a custom price quote for this tour, please fill out the online inquiry form and give you as much information as possible about your trip. Your online travel consultants will be at your service and help you make the most of your travel time and dollars! Pick-up / Drop off at Lao Cai Train station. Pick up / Drop off at Hanoi Hotel to Hanoi Train Station.